In 2014, my husband and I had two in two years. We also lived on less than $2,000 per month. Having a lot of baby things simply wasn’t an option during that season of life. However, we did save up for a number of quality baby items, and I’m glad we did. We may not have had new living room furniture or all new kitchen appliances, but if there was something costly that got its money’s worth for our kids, then it was money well spent. Hear me out. One thing we did not do is go into debt to purchase these items. Nor did we dip into our emergency fund. Either option would have been so much easier. Instead, we opened a checking account with no minimum balance required and labeled it our “Baby” account. Each month, we’d budget an allotted amount into the account. Having it separate from our primary checking helped protect that money from being mishandled. We saved up, used coupons, used gift cards, or we said no to the purchase. There are so many different brands of these products, but here are the ones we chose and that I recommend. We kept our babies in this Rock N’ Play throughout their entire newborn stage. It was so nice to have them right next to our bed at night, elevated so they could probably breathe when congested. Another perk was how lightweight the product was. After I had an unexpected c-section with my second child, I had a major weight restriction during the first several weeks. The Rock N’ Play was easy to fold and transfer from room to room. I made the choice before my first child was born to breastfeed. I was still employed at my banking job during that time, so have a reliable and efficient breast pump was crucial. Since that time, the government has made it much easier to obtain breast pumps for free or to receive reimbursement on a purchase. Definitely look into that. If you can’t get one (a QUALITY one) for free, then I highly recommend this product. It hasn’t given me any problems and I was able to breastfeed both of my children for at least 12 months. The features I love most about these swaddling blankets is that they’re sheer which reduces the risk of suffocation, and they’re large enough to do a full swaddle on a baby throughout the first six months to a year. My 2-year-old son still chooses his Aden and Anaias blankets to sleep with over any other bedding. If you’re up at 2:30 AM with a screaming, feverish baby, you need a reliable thermometer that will tell you exactly what’s going on, every time. I tried the cheap route at first, using a knock-off thermometer under the baby’s armpit (try getting a fussy baby to keep his arm down long enough to get a consistent reading). Finally, I realized it wasn’t worth the risk of misdiagnosing. High fevers can spike at any time. I’ve caught each of them in time with my Braun ear thermometer. What I love about wooden toys is that they’re made well. My parents grew up in the era of wooden or metal toys. I was raised throughout the dawn of plastic. To see the difference in toys like Melissa & Doug and many others is very refreshing. I head straight to that aisle every time I buy a gift for a baby shower or child’s birthday party. 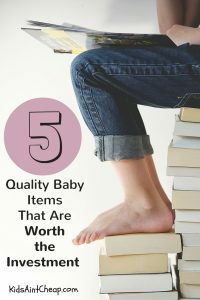 What quality baby items are you grateful you purchased? Share in the comments below!